Nestled on the Largo Bay shores is a charming country house with spectacular coastal views, a substantial annexe and permission to erect your own beach hut. Strathairly Cottage is a fantastic find in Fife and is on the market though CKD Galbraith. Strathairly is situated in Upper Largo and is set in 2.5 acres of grounds with mature woodland and rumbling burn, completing the idyllic picture is the direct access via your own footpath down to the beach. 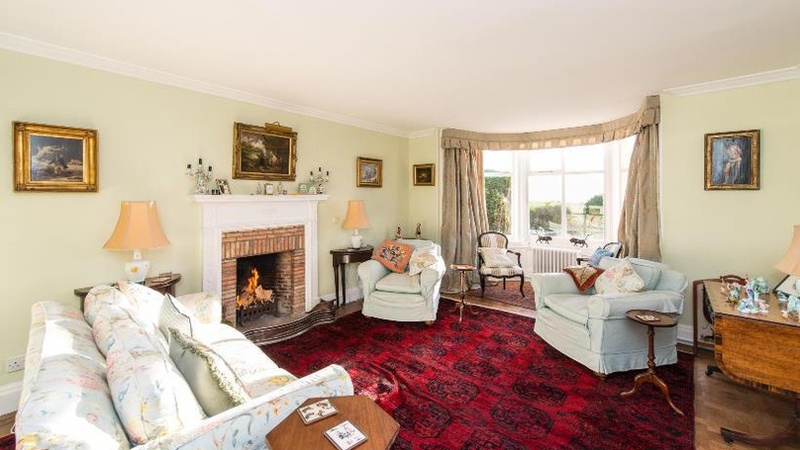 The property has four reception rooms, six bedrooms and an impressively spacious two bedroom annexe with its own lovely reception room and door to the gardens. This is a lovely country house set in a private rural location but only a short distance to the east of Upper Largo and about five miles to the west of Elie. St Andrews and the bustling market town of Cupar are both about a fifteen minute drive north of the Cottage and offer great local amenities and activities. The property dates from the 1970s when it was formerly the dower house to the Strathairly Estate. It was extended in the early eighteenth century in the Arts and Craft style' creating the characterful architectural style that exists today, including the feature turret and crow stepped elevations. Internally the house is charming and well laid out with the south facing reception rooms overlooking the gardens and grounds beyond. Glimpses of the sandy beach of Largo Bay can also be seen from many of the south facing rooms. Dominic Wedderburn, handling the sale from CKD Galbraith's Cupar office, said: "Strathairly Cottage has countless selling points; it's a spacious and bright country house with outstanding coastal views, permission to erect a beach hunt on Largo Bay beach and is situated in a prime rural location with quick access to nearby cities. In addition to this the property also boasts a modern two bedroom annexe. "The former stables were converted by the current owners back in 2008 to create an extremely comfortable living area comprising of a kitchen dining area, drawing room, utility room with WC as well as two bedrooms and a bathroom on the first floor. "Outdoor enthusiasts have endless activities available to them with walking, cycling, sailing, horse riding and of course plenty of golf on offer in the surrounding areas. The Largo Bay and Fife Coastal path can be accessed by pedestrian right of access over a neighbouring field as well. "With so many merits and wonderful features, we expect Strathairly Cottage to result in a quick and competitive sale so I would recommend early viewings and offers from those taken by this Fife delight!" Strathairly Cottage is available for offers over 730,000. For further information or to arrange a viewing please contact CKD Galbraith's Cupar office on 01334 659980.